The talented Las Hermanas Caronni are excellent musicians and singers who love going off on a musical tangent to further adorn and celebrate their Argentinian roots. For their new album Santa Plástica, they have invited jazz trumpetist Erik Truffaz and the entrancing voice of Piers Faccini. Beyond new horizons, they take us by surprise with bits of music by Ravel, Mozart, Bach or Piazzolla, to compose what they cleverly refer to as a "classidoscope". Whether it is about current events, mourning or lost love, the Caronni sisters unequivocally transmit their pure emotion with light, inviting us to a serene escape. They are Argentinian, but before all musicians. Born on the same day at 10 minutes of interval, Laura and Gianna Caronni settled down in Europe towards the end of the 90s, to continue their musical studies they started on the banks of the Paraná river, in their hometown of Rosario in Argentina. 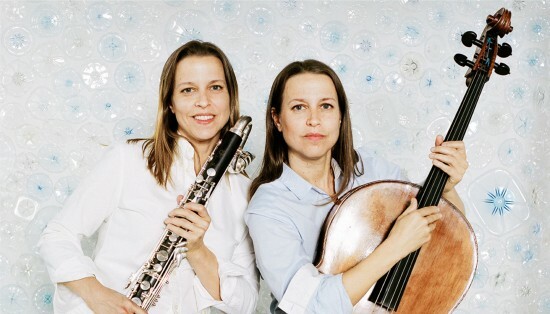 The two sisters were part of the Academic Orchestra of the Colon Theater of Buenos Aires, as well as various formations ranging from Renaissance music to contemporary repertoire, and traditional music. They performed hundreds of concerts from the age of 12 in the main concert halls of Argentina. They won prestigious national competitions (Foundation Antorchas and Fondo national de las Artes) and pursued their training in France, at the Music Conservatory of Lyon. Then, they work separately on composition, took part to the creation of different dance, storytelling and theater shows. In 2006, encouraged by their fellow musician Juan Carlos Cáceres, they began to work and interpret their own compositions. Their first album "Baguala de la siesta", was released in 2011 ("The discovery of the season" according to Didier Varrod on French public radio 'France Inter'), followed by "Vuela" in 2013 and "Navega Mundos" in 2015.